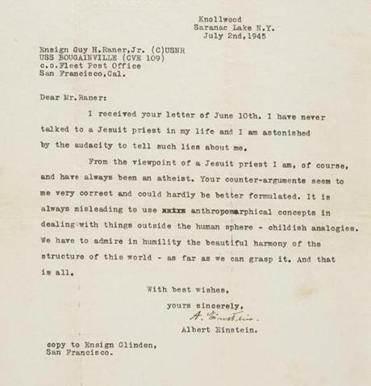 “The God Letter” from Albert Einstein. In 1914, some kid named Babe Ruth showed real promise in his pro baseball debut. This “St. Mary’s schoolboy is going to do plenty of twirling,” the Baltimore News noted in its April 4, 1914 issue. It’s the earliest known mention of Ruth in a newspaper in original form. Shortly after the story ran, the Bambino went to the Red Sox. The article is just one item up for auction from “Treasures from the Eric C. Caren Collection: How History Unfolds on Paper.” The online-only auction is going on now through March 14 at 5 p.m. though international auction house, Bonhams. A collector of baseball cards from about age 5, and a collector of “how history unfolds on paper” since age 11, Caren has amassed a major collection — some 1 million original and rare newspapers, manuscripts, photographs, posters, broadsides, postcards and ephemera dating back to the time of Columbus, he said. This is his seventh major auction in the “How History Unfolds on Paper” series. A printed broadside on the battle of Bunker Hill, 1775, a response to one of the earliest major battles of the Revolutionary War. Two of Paul Revere’s engravings of Boston, including one of the Boston Massacre. A front page story on the Salem Witch Trials from The Athenian Mercury’s Dec. 31, 1692 issue. A 1777 commission signed by John Hancock, promoting Benjamin Lincoln to the highest rank Major General in the Continental Army. Lincoln had served as Major General of the Massachusetts militia. Bonhams is estimating a conservative $100,000-$200,000 on the letter, Caren said.